This is my mother-in-law’s go-to recipe when she is really craving carbs. I really relate to her, as I often crave exactly that – a load of carbs in the shape of potatoes and pasta! I often cut the potatoes and soak it in water overnight. Or cut them in the morning and soak them until dinner time. Obviously, you do not have to do that. But the potatoes cook so much better without getting mushy. Either way, I recommend soaking potatoes in cold water for at least 30 minutes before you completely dry them and get them ready to cook. Peel and wash potatoes. Cut them into half an inch discs and cut them across in half an inch strips. 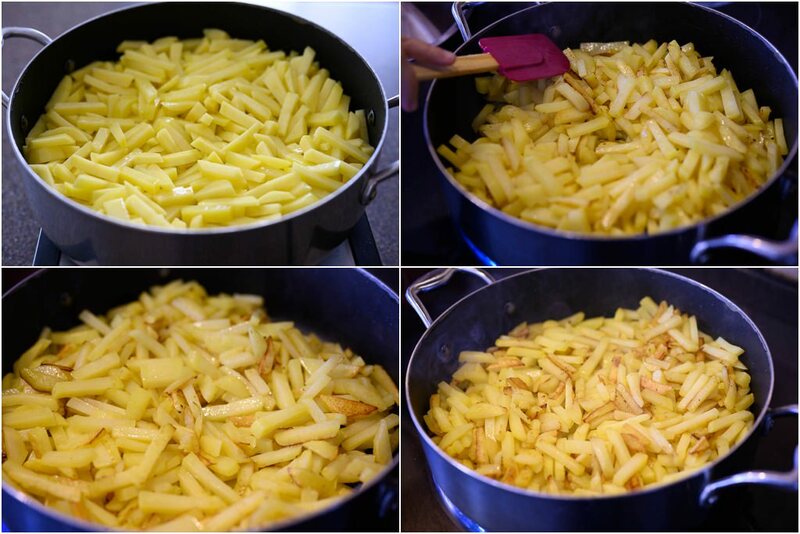 Soak potatoes in plenty of cold water for at least 30 minutes. 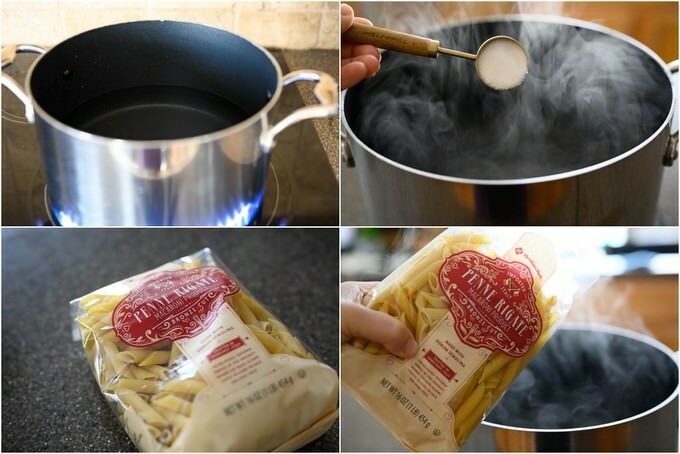 Boil a large pot of water, add 1 TBSP salt and add penne pasta. Cook until penne pasta is al dente. Once cooked, drain the water, splash with some cold water and set aside until needed. Cooking pasta and cooking the potatoes can be done at the same time to save time. Meanwhile, slice onion thinly and caramelize it in 1 TBSP clarified butter or butter. 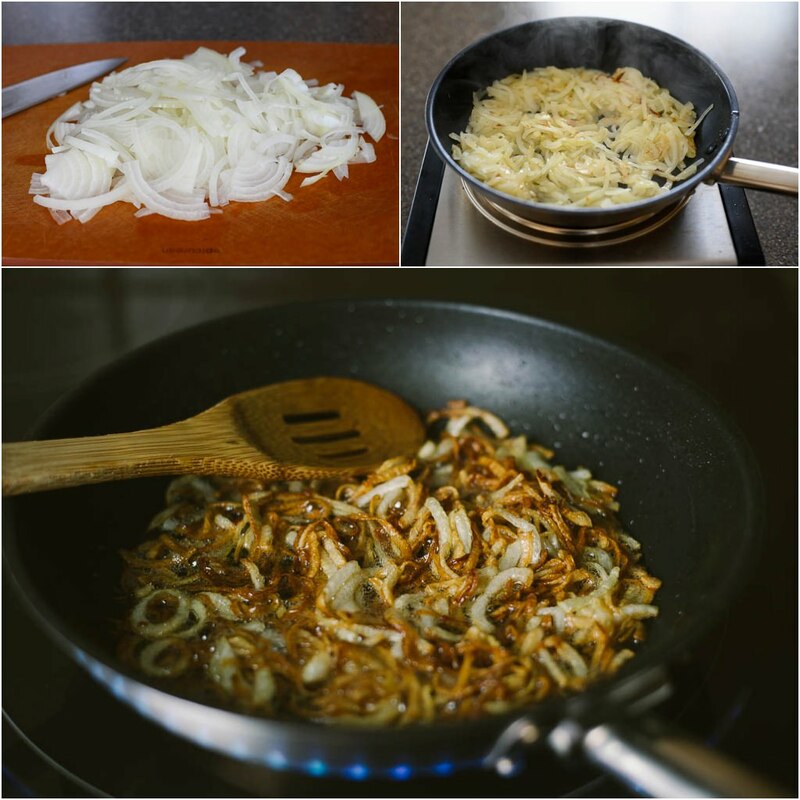 Follow this link to learn how to caramelize onions. Right before the onions are done caramelizing, add chopped garlic into the skillet with onions. Saute for a minute and turn off the heat. Set caramelized onions aside until needed. Drain the water from under the potatoes, dry them with paper towels. Place a large skillet on medium-high heat and add clarified butter. Drop the potatoes in the skillet. 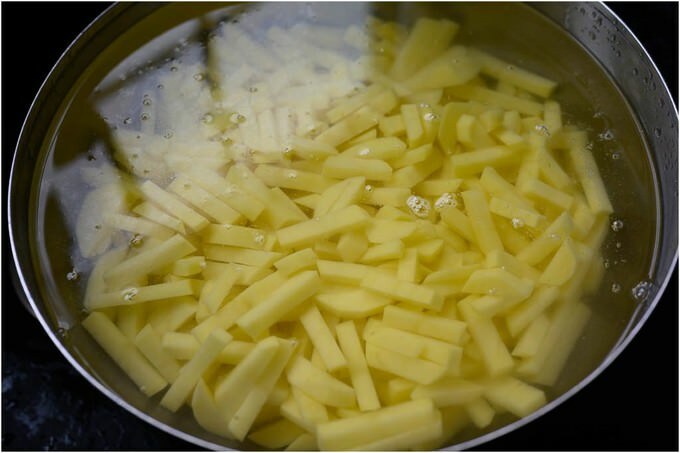 Since much of the starches are left in the water, potatoes should not stick to each other and cook nicely. Once the potatoes start sizzling, turn the heat down to medium and cook them until they are soft in the middle and golden brown on the outside. This is a good time to add 2 tsp of salt to potatoes. My stovetop could be different than yours. Try not to cook the potatoes in too much of high heat. They will take a little longer to cook. However, the end result will be great. Don’t forget to mix the potatoes occasionally. However, do not overmix to the point where you will have a whole bunch of mush on your hands. Not all potatoes are going to cook evenly. We didn’t add that much oil to cook the potatoes uniformly. The point is to achieve country style potatoes. What matters is that potatoes cook through. 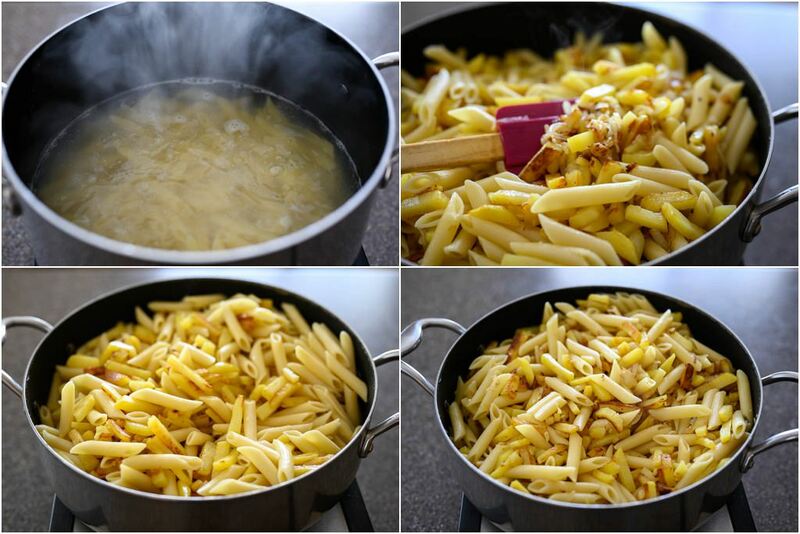 Once the potatoes cook well, add caramelized onions and drained penne into the skillet with potatoes. Mix everything well and let penne soak up some of the butter from under the potatoes. If you wish to increase the heat just a little, it will also add a little crust on the penne. Totally optional, but I really like it that way. This is one potato recipe no kid will say no to. It comes together very easily, which any parent appreciates and can be delicious comfort food for anyone. 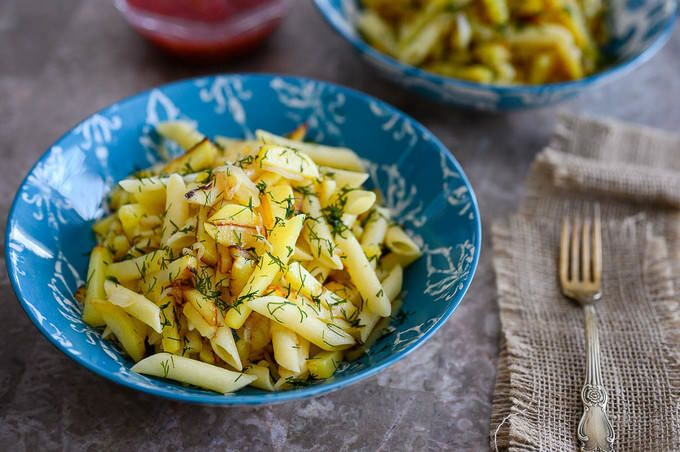 What makes this easy potatoes recipe strike a cord is a perfectly cooked potato in clarified butter, caramelized onions, and slightly crispy penne pasta! Boil a large pot of water, add salt and add penne pasta. Cook until penne pasta is al dente. Once cooked, drain the water, splash with some cold water and set aside until needed. Cooking pasta and cooking the potatoes can be done at the same time to save time. Drain the water from under the potatoes, dry them with paper towels. Place a large skillet on medium-high heat and add clarified butter. Drop the potatoes in the skillet. Since much of the starches are left in the water, potatoes should not stick to each other and cook nicely. Once the potatoes start sizzling, turn the heat down to medium and cook them until they are soft in the middle and golden brown on the outside. My stovetop could be different than yours. Try not to cook the potatoes in too much of high heat. They will take a little longer to cook. However, the end result will be great.